Naturalmente are a natural, organic and eco-friendly company that create products such as this conditioner. This conditioner is free of parabens, petrochemicals and well basically any nasties that I simply hate and will not tolerate, especially when it comes to my family and what is used on them. Normally with conditioners and most hair products to be honest I am pretty hit or miss, there's never an in between with how well they perform which drives me cray-cray. When I was asked if I wanted to review this product I instinctively said yes when I read about it's ingredients but then started to think 'meh' it's either going to work or it's not. It arrived and I plonked on it's spot on the edge of the bath and didn't really think too much about it, that night I washed my hair and decided to try it out. The first thing I noticed was the absolutely yummy scent which reminded me of sweet vanilla although it isn't scented with vanilla. I then squeezed out a small blob and applied it to the ends of my hair and then the leftovers to the top sections of hair. I waited around ten minutes as I do with all conditioners and rinsed. Even when rinsing my hair it felt super soft and glossy. When I woke up the next day my hair was so shiny I was grinning from ear to ear because that just never happens to my hair. My cousin even said 'oh what have you been using on your hair' because it normally tends to look dull and ratty due to humidity. I did revert back to my old conditioner just to see if it was a fluke and low-and-behold the dull hair reappeared. 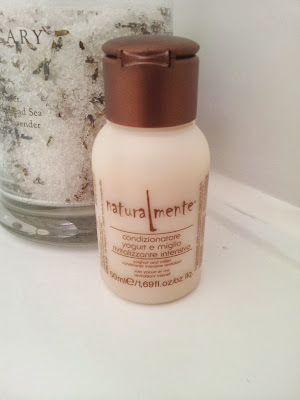 Ever since then I've used the Naturalmente and my hair has been baby soft and really shiny - I adore it. Ingredients include Jojoba Oil to nourishes and give shine to the hair, Mint to calm the scalp, Eucalyptus to detox and Lemon to stimulate the hair and promote growth, honestly it's all good stuff. I have the 50ml size which will last longer than you'd imagine as you only need a 20p size blob. Other sizes are available and do you know what impressed me greatly? Most brands that create products that work sometimes inflate their prices, they know it works and they want to create a premium product, price is the easiest way to give it the 'premium' branding. Naturalmente creates extraordinary products which are kind to your hair and overall health but DON'T inflate the prices. This 50ml size only costs £2.60 and you can find this as well as the rest of the Naturalmente shampoos and conditioners over on Gentle Body Care's website here.